When winter comes, it brings cold weather, ice, snow, and all sorts of things with it, depending upon where you live. Even on the best of days, working near the roof can be a dangerous thing. Even professional roofers take precautions and use equipment to make the job safer. It is never recommended that you climb your roof, but if you have to get on a ladder to take a look, there are roof dangers in winter of which you should be aware. Be Aware of Roof Dangers in Winter. That snow may look harmless, but on your roof it can be covering any number of problems. If you’re not careful, you might just place a hand or a foot on a weak spot. You could end up with a hole in your roof. Or, you could touch something that causes you to lose your balance and fall. There are any number of dangers snow can hide. You cannot always see ice. Sometimes, it’s so clear and thin that we don’t notice it before we stop on it, or touch it. 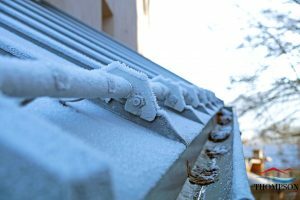 If you’re doing something on your roof, or even at its edge, you could easily slip on ice, and there are innumerable ways that could leave you injured. Wind may happen all year long, but it still poses a threat. A cold burst of wind is enough to knock you off your ladder, or leave you unsteady enough to fall. Winter wind can be a very, very dangerous thing. In the end, it is always best to leave your roof to the professional. Watch out for roof dangers in the winter and if you need roofing services, call Thompson Roofing & Reconstruction at (573) 789-8367 and let our professionals handle them. Posted in Uncategorized on December 18, 2017 at 5:36 pm by Thompson Roofing & Reconstruction.